A.A. Bosschaert was an admirer of the architects Richard Neutra and Ludwig Mies van der Rohe. 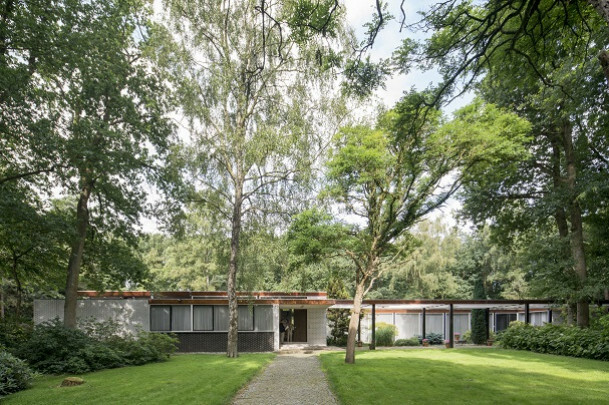 He came into contact with Rietveld through the Royal Institute of Dutch Architects (BNA) and commissioned him to design a country house with four individually lettable rooms. Upon Rietveld’s death, there was a falling out between Bosschaert and the Rietveld Van Dillen Van Tricht office. After much legal wrangling the house was seen onto site by another architect, G. Bakker, fully in keeping with Rietveld’s design. As in many post-war designs for free-standing houses, the spacious interior and use of materials and colour bear clear reference to De Stijl. The front facade is 47.5 metres long.